From generating advertising income to cutting hard costs to increasing sales, digital signage can boost your profits. Not all digital signage is created equal. For some companies or uses, entry-level technologies suffice—especially when that’s what your budget dictates. However, when you’re trying to stand out—particularly to high-end customers or in industries that cater to discerning consumers—you want your signage to reflect that. To take advantage of the right opportunities for your organization, consider these approaches to digital signage. Is there a place where you have a “captive audience”? An area where employees and visitors congregate such as a cafeteria or lobby? A place where customers stand in line? Digital signage can help you transform those dead spaces into revenue streams. For example, you can use digital signage to offer flash sales to customers waiting in line. 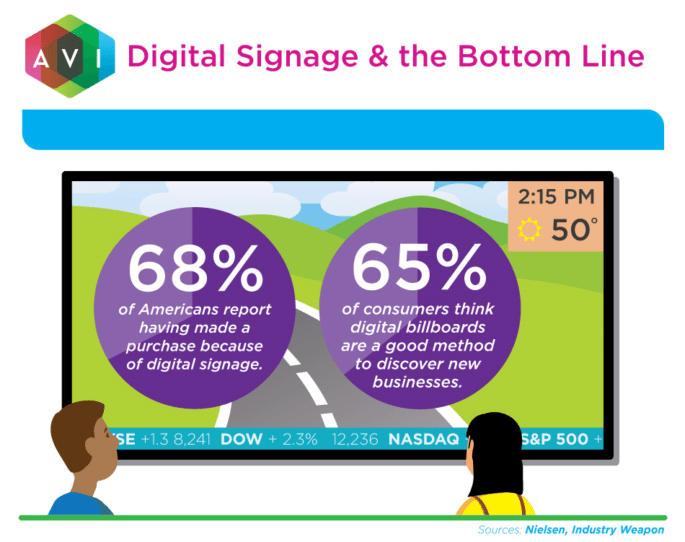 Sixty-eight percent of American shoppers report having made a purchase because of digital signage. You can also use digital signage to entertain and inform visitors in your lobby or waiting room. It can boost customer satisfaction as it has been shown to reduce perceived wait times. Location can dictate the kind of signage you choose. For example, LED displays are best viewed from a distance. If your customers are going to interact with your digital signage, you’ll want clear, responsive equipment. Other location factors that will affect your purchase decision will be glare, angle, indoor/outdoor placement, and more. All your content should be up to date and switched out frequently so employees and visitors don’t tire of it and start ignoring your digital signage. It’s well known that visually appealing content with graphics or animation will help catch and hold people’s attention. Does it sound like a lot of effort and money to keep digital signage content relevant and fresh? It doesn’t have to be. What distinguishes consumer-grade digital signage from high-end digital signage is not just the quality of the hardware, but also the quality of the content. If you’re just throwing content up on your signs without any planning, it may not be much better than having no signage at all. Highly effective signage will display fresh and compelling content that is easy to view. This requires quality hardware and software. If you’re not creating your own professional content, one answer is to employ a tool that provides worry-free content media services. In the high-end solution, it can come as part of broader platform that helps you manage, maintain, and future-proof your digital signage. Some hard cost savings from implementing digital signage are immediate. For even entry-level signage, you’ll see benefits like spending less on developing and printing flyers, brochures, posters, advertisements, and static signage. Companies that implement high-end digital signage generally look at it as a long-term investment that improves communication on numerous levels. They know it will impress visitors and improve engagement. Another benefit example is that organizations can increase employee productivity by using digital signage to provide information previously provided by employees, such as wayfinding, event details, promotion information, and other frequently asked questions. Then they’ll have more time to devote to their primary duties. Hard benefits of digital signage include increased sales or savings from replacing costly employee or print communications. 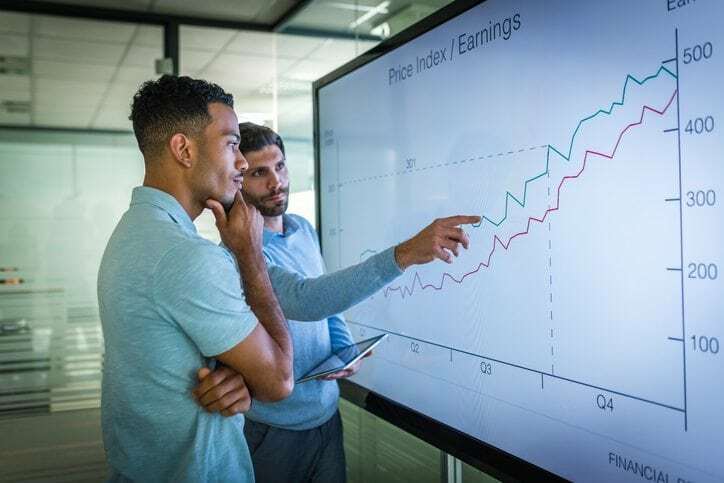 Companies that opt for higher quality digital signage can also see returns on investment like improved reputation, brand reinforcement, and engagement with customers. In short, there are many ways to cut costs and generate revenue by implementing digital signage. There is also a wide range of quality in available options. Whether you choose consumer-grade or high-end signage depends on your budget, goals, and priorities. When done right, digital signage is an investment and an opportunity to spread your message, grow your visibility, and boost your bottom line. An experienced integrator, like AVI Systems, can help you explore all the available options, including innovative and custom solutions, like those manufactured by NanoLumens.